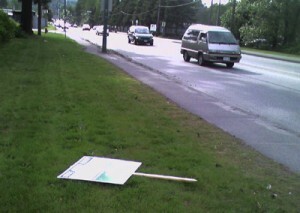 It’s ironic that the only discarded election sign I found littering our city was for the Green Party. You would think that, of all the political parties that plastered our city with their visual blight, The Green Party would ensure they picked up and recycled their election garbage? 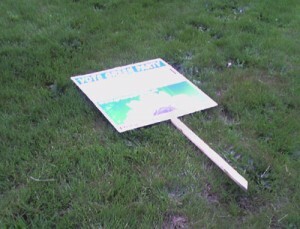 Perhaps if their signs could be rolled and smoked rather than recycled they would have been more vigilant. I have a new slogan suggestion for them…The Greens – Not really so green after all.